3d orange red or red featuring a beaver in a river. 10d blue featuring a three quarter portrait of Jacques Cartier. Sir Sanford Fleming, who was instrumental in the construction of the Canadian Pacific Railway, and who was featured on a stamp issued in 1977, designed the 3d and 6d values. The 10d was adapted from a sketch by William Henry Griffin. The 1/2d design was after a bust designed by William Wyon, which was popular on the coins issued during the period in the UK. Finally the 71/2d and 12d values were based on the famous portrait of Queen Victoria by Alfred Chalon. The very first printings were made on a very thin, laid paper, which is extremely fragile. Only the 3d, 6d and 12d are found on this paper. Starting in 1852 a stronger wove paper was employed for the other values. These stamps have full catalogue status in that almost albums contain a space for the 3d and 6d on wove. Stanley Gibbons lists the 12d on wove, but Canadian experts maintain that it is not wove paper, but merely laid paper in which the lines are not clearly visible. There are also two additional printings of the 6d which many albums contain a space for. One is on thick hard paper in grey violet (Scott #5d) and the other is on thick fibrous opaque wove and is in a distinct reddish purple shade (Scott #10). 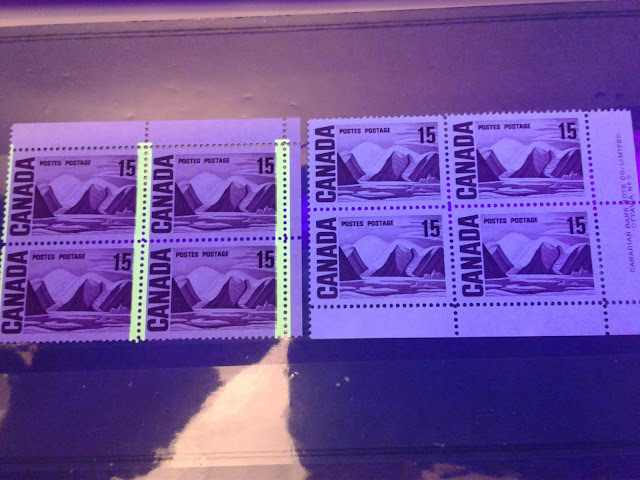 In mint condition, the stamps of this issue are all extremely rare and except for the 3d on wove paper, are all over $10,000 each in mint condition. In used condition, the both 3d's most of the 6d's, the 10d, 1/2d and 71/2d can all be had for under $3,000 each in fine condition. Top notch XF or better quality will of course cost a lot more, but very sound examples can be obtained by most conscientious collectors willing to be patient. The 3d beaver was Canada's very first stamp issued on April 23, 1851. The initial print run, of which this is an example, was 250,000 stamps. The number surviving today in condition like that shown is very minute. There are fewer than 10 unused copies thought to exist. At a minimum, a mint example without any of the original gum will be at least $10,000. A very fine used example catalogues $1,600 and will usually sell for close to that amount. This initial printing is on a very thin, laid paper, which shows feint horizontal lines accross the stamp. Sometimes they are so feint that they require immersion in watermark fluid to see them. Above is the 10d value from a seller on E-bay. There is an nice 7.5d value courtesy of the internet. The 12d black above is one of the rarest stamps in the world. 50,000 were originally printed, but only 1,450 were sold. The remainder were destroyed in 1857. Even back in the 1860's this was universally recognized as a rare stamp. This issue does offer some challenging points of interest for the ambitious philatelist who wants to go beyond obtaining one example of each basic stamp. Even collectors of modest means can specialize in this issue provided that they are willing to accept examples in VG condition or below. To form a collection of fine or better examples to any degree of specialization would be a very expensive endeavour indeed. 1. Shade varieties on all values except the 12d black. 2. Additional paper varieties on the 3d, 1/2d and 10d. 3. Stitch watermarks on all the wove paper stamps. 4. 4-ring numeral cancels for different towns. There are 54 numbers in use during this period, some of which are unknown as yet. 5. All the 6d's and the 3d on wove paper are known bisected on cover and used as 3d's and 11/2d's respectively. 6. Of course all the values can be found on cover. 7. Re-entries are found in all the stamps except the 6d's and the 12d. 8. A wide variety of plate proofs in both the issued and trial colours can be found. These are generally not nearly as expensive ($200-$500 each) and make a good alternative to mint stamps. Unitrade lists 48 varieties including the proofs overprinted specimen. 9. The 71/2d can be found with a plate flaw in the upper right fraction of the value, where the "1" is almost obilterated. You may be wondering what a stitch watermark is. Well it is caused by the joining of the paper rolls. Paper in these days was handmade, and as the rolls were joined together, they had to be stitched together. This leaves a clear stitch pattern, which can be either horizointally or vertically oriented accross the stamp. As you can imagine these would be exceptionally rare because they would occur so infrequently to begin with, and the odds of the few stamps printed on this are of the paper so affected would be very low. Unfortunately Unitrade does not tell you how to distinguish the thick papers and thin papers from the normal medium wove. That will be the subject of another post, when I myself learn the differences. The 10d comes on both a thick opaque white wove and a thin, crisp transparent wove, while the 1/2d rose in addition to the normal medium wove, exists on horizontally ribbed and vertically ribbed papers, both of which are very rare. It has been suggested by the late philatelist, Robson Lowe that reddish purple might well have been the original and only colour that this stamp was issued in and that all the shade varieties have been the result of changes caused by chemical reactions over the years. He based his theory on the fact that there was a very notable Parisian dealer in the early 20th century that had purchased stocks of the stamp when it was issued. There is obviously no way to prove this either way now, so all of these colour variations remain collectible. The 10d exists in a blue and dull blue shade. The 71/2d green comes in both regular and dark green and finally the 1/2d rose exists in a lilac rose shade as well.